SaaS Clients: Find out the time, cost, and even value for your next growth marketing project… before you start! Are you considering a new marketing project, but uncertain on the cost, the timeline, or other essential factors? Working on a project is risky. What if the timeline is longer than you’re looking for? What if the steps involved are more complex than you’ve planned? The last thing you want is to start a project and find yourself spending thousands of dollars and not moving towards the outcome you’re looking for. What if you could reduce the risk around your project? 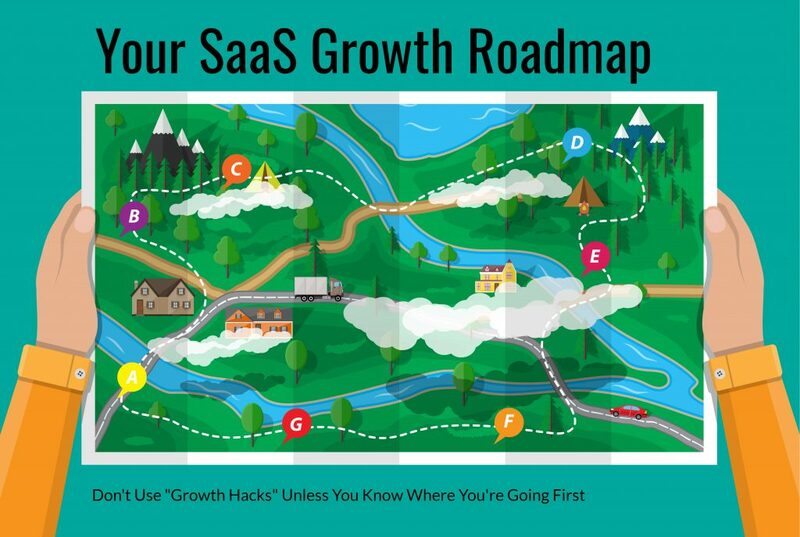 A SaaS Growth Roadmap project is an opportunity for the two of us to meet, discuss your current situation, review the outcomes you’re looking for, and determine the best options to get you moving from where you are to where you want to be. You walk away with new SaaS growth ideas (as a result of us working together) that will get you even closer to the outcomes you’re looking for. You reduce the risk surrounding your project by discussing the outcomes you’re looking for, your current situation, and any risks or assumptions surrounding the project. When we work together on a Roadmapping Project for your business, we’re working together to provide you with expert advice and direction. My job is to give you direction on your project so you know if what you’re planning on doing is what you actually need to do. Most importantly, the deliverables from this Roadmapping Project are portable. That means you don’t have to work with me to execute the plan. There’s no lock-in contract. What you receive will get you closer to where you need to be. Are you ready to get customized insight to achieve your SaaS growth goals? Click here to book a short introduction meeting so I can answer any questions that you have. Next, if we both feel working together would be a good fit, you’ll pay for the Roadmapping Project and I’ll send over more information and next steps. My goal is to help you determine if working together is the right investment for your business, not hard-sell you on something that you don’t need. I’m not the right person for everyone. How does a Roadmapping Project work? After you pay, you’ll receive a questionnaire to fill out about your business, the outcomes you’re looking to achieve, and the situation you’re experiencing. Next, we’ll schedule a time for us to have an in-depth 60-minute ‘Working Session’ conversation about your business. We’ll discuss your business, the situation you’re experiencing, and the outcomes you’re looking for. On the call, I’ll contribute my insight to your available options and answer any questions you have. After our call, I’ll research the situation you’re experiencing and the outcomes you’re looking for. I’ll put together a report for you and your business. In this report, I’ll summarize the major takeaways from our meeting and contribute my insight and expertise to the different options at hand for your business and best path for you to follow to achieve your intended outcomes. You can expect to receive your report within 10 business days of our meeting. Any time you’re working with any kind of outside vendor for the first time, there’s always some hesitation. Anybody can sell you their services, but they don’t always deliver. Any concerns I had were alleviated after just one or two conversations with Bruce. He showed more experience than others we considered for the project. He asked the right clarifying questions to dig deeper into what we needed. We definitely benefited more from that dialogue than if he just went straight into creating what we requested. He took our loose plan of topics and suggested five or six more concise and focused topics, which demonstrated the depth of his knowledge. We would highly recommend Bruce to anyone looking for a content creator. He’s very insightful, took the time to understand our business and our objectives, and had a lot of great recommendations for us. He was able to quickly produce quality content on technical and niche topics, including great research, and elevated our initial ideas to something that was engaging for the reader. What’s unique about a Roadmapping Project? Unlike other consultants who offer a free consultation before sending you a proposal, with a Roadmapping Project you’re assured that our work together gets the same attention that any other paying project receives. Additionally, you can rest easily known that my recommendations on how you should proceed are based on a detailed discussion about your business, your goals, and your current situation. This allows me to fully understand the situation you’re experiencing and the outcomes you’re looking for. A ‘free proposal’ without necessary research is, at best, guesswork. At worst, it could be like going hiking on a new trail without a map: at best, it takes twice as long and costs more than expected. Without a clear map, you end up going down dead ends and have to reverse course. A roadmap keeps you moving straight to the end goal. Roadmapping Projects are only $1,000. If you want a plan that will help us both understand the right steps to take to help you achieve the outcomes you’re looking for, you’ve come to the right place. A Roadmapping Project is an easy way for us to review the outcomes you want to achieve and discuss the options for you to get there. And the only way to get started is with a Roadmapping Project. Then a Roadmapping Project is a terrific way to determine how we work together and what steps to take to help you achieve your outcome. The first step is to book your introduction call. I promise that once you apply, my goal is to help you determine if working together is the right investment for your business, not hard-sell you on something that you don’t need.